Paramount provided me with a free copy of the Blu-ray I reviewed in this Blog Post. 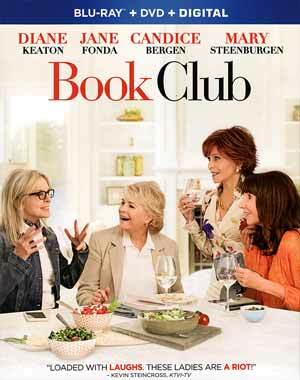 Plot Synopsis: Diane (DIANE KEATON) is recently widowed after 40 years of marriage, Vivian (JANE FONDA) enjoys her men with no strings attached, Sharon (CANDICE BERGEN) is still working through her decades-old divorce, and Carol’s (MARY STEENBURGEN) marriage is in a slump after 35 years. The lives of these four lifelong friends are turned upside down after reading the infamous “50 Shades of Grey,” catapulting them into a series of outrageous life choices. Quick Hit Review: Book Club is a fun and utterly charming and surprisingly funny comedy with an all around wonderful ensemble cast of ladies, and some of the men, don’t really get their dues especially lately. The standouts here are probably Jane Fonda and Diane Keaton as both of their stories do take up the bulk of the movie with Candice Bergen (nice to see her return in the revival of Murphy Brown) and Mary Steenburgen taking a bit of a backseat, though both of them do have their moments. I was genuinely surprised by Book Club because the trailers and TV spots I did see didn’t appeal to me and truth be told, the catalyst of these ladies reading “50 Shades” does seem a few years too late. Even so, I admit that I did chuckle and even laughed at much of the humor and the characters were generally likeable. Is the film anything special? Not quite but still well worth the cost of a rental. This release comes with a matted slip cover and inside is the redemption code for the Digital HD copy. It All Started with a Book (10:56; HD) takes us behind-the-scenes on how the project came together with the script writer Erin Simms and coming up with the inspirations for each of the women. Casting Book Club (13:43; HD) delves into how the ensemble was ultimately put together. Location, Location, Location (9:48; HD) is on shooting the movie in and around Los Angeles. A New Chapter (9:03; HD) – This is a standard behind-the-scenes featurette with interviews by the cast and filmmakers on what the movie is about. Living in the Moment (3:48; HD) is a featurette on recording the song sung by Katherine McPhee. Deleted Scenes (11:11; HD) – Here are 13 scenes that were cut or entirely removed. Paramount releases Book Club presented in its original 2.39 widescreen aspect ratio and a 1080p high-definition transfer. This being a light-hearted comedy, the picture looks bright and detail is relatively sharp and while this isn’t going to impress on the big small screen, it still looks rather good. The disc includes a basic DTS-HD Master Audio 5.1 track, the bulk of it is dialogue with some whimsical or canned-sounding music/score making up the front and rear channels along with some ambient noises. Overall, Book Club is a fun and well acted comedy-drama featuring four wonderful performances from its leads Diane Keaton, Jane Fonda, Candice Bergen and Mary Steenburgen, and a respectable supporting cast, top lined by the underappreciated Andy Garcia. The Blu-ray release offers good video and audio transfers and an okay selection of bonus features.